It may be time to retire your rainbow pool float and swap your favorite rosé for a glass of red; summer is over and we’re ready to dive into fall. Well, maybe not completely ready (RIP to our tans) but certain things have us excited for the new season—cozy textiles, newly in-season food, and, of course, a range of bold colors to transform our homes. While re-painting each room and overhauling your furniture per the change in seasons isn’t the most practical option, you’d be forgiven for adding one new piece to your space. Consider it a treat to get yourself through the colder months, or an investment towards your New Year’s resolution of being more adventurous in your style. To help, we’ve rounded up our favorite seating options to spruce up your living room in four of autumn’s trendiest colors. From vivid orange to soft lilac to rich blues and deep burgundy, here are the living room seating pieces in our carts for fall. Who doesn’t love burnt orange? 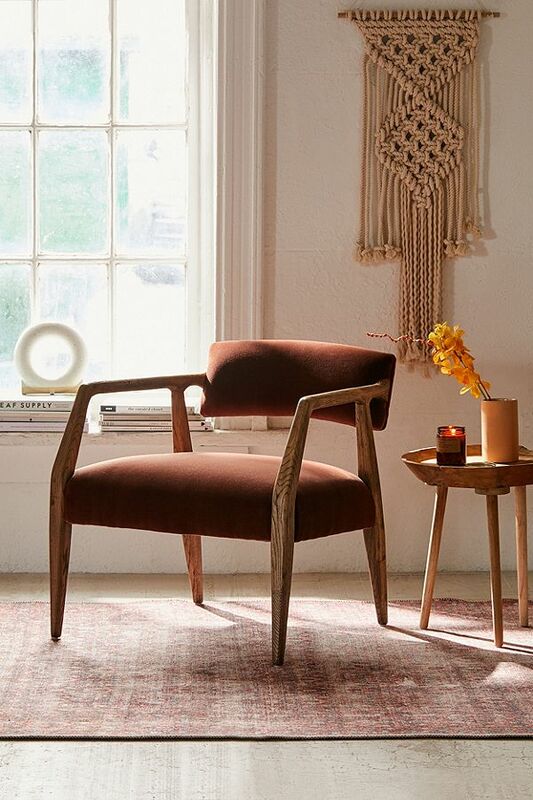 This plush, rust-toned “beetle chair” is a great way to incorporate the iconic silhouette into your home, using one of our favorite statement-making colors. Bring in a hint of mid-century modern to your living area—juxtaposed against warm colors for a tonal vibe, it’ll look all the more impressive. The concept for this piece was designed in 1939 by French architect Jean Prouvé, meaning this lounge chair is essentially a bit of design history in your living room. Cream-colored steel legs coupled with panels of wood in the armrests are a welcome respite from the brass furniture legs we’ve been seeing everywhere (not that we aren’t still obsessed, mind you). Fill an empty spot with some cool retro seating that’ll surely be the focal point of any room. This gorgeous piece is more than just chic: It’s functional and ideal for small-space dwellers, thanks to a built-in side table that eradicates the need for a coffee table or end table if you’re short on space. Muted lavender makes it more interesting than your standard whitewashed or neutral sofa, without threatening to overpower your living room. Whether you use them in your dining room, your living room, or in your combined living-dining room, this pair of lilac bistro chairs will bring in a contemporary edge. Curved backs elevate them from your standard metal folding chair set, and a simple throw cushion is all that’s needed to turn them into comfy seating for extra guests. Crushed velvet in a dusty mauve lends a particularly opulent feel to this seat. It’ll make the perfect addition to your reading nook, where you can curl up on colder nights with your favorite book or binge-watch your favorite TV show. It’s handcrafted locally from sustainable wood, so you can feel good about splurging a bit on an eco-friendly living room essential. Remember when we said swivel chairs were trending? Consider this your way to get in on the retro ’70s style. Designed in partnership with HGTV host Alison Victoria, the elegant piece will round out your living room and add a bit of luxury with its velvet finish. Opt for the deep “Ink Blue” colorway to bring a bit of drama to your living room. The bold shade is juxtaposed perfectly with an otherwise simple frame, balancing out the design in one statement-making item. For when you have a bit of extra space, opt for a matching chair and ottoman set to maximize function (the ottoman will come in handy when you need extra seating for guests) and square footage. Hem’s Hai chair set is inspired by both Italian and Nordic design and feels both modern and timeless at the same time. It’s a worthwhile investment you’ll love for years to come. Sleek, contemporary, and oh so cool, this oxblood sofa instantly captures the eye. Consider it a modern way to decorate with leather that doesn’t feel tacky, thanks to the simple silhouette and unique color. For a less dramatic burgundy, try this armchair. Its wood fiber makeup lends a fresh textural quality to the piece, and though it may look less-than-comfortable, the interior of the chair is actually upholstered with foam and fabric to provide comfort from the inside. Use in a home office or your living room for an unexpected pop of color. The deep wine shade of this velvet armchair is quintessentially autumnal, and we’re here for that. A simple wooden frame makes this piece an instant classic, suitable for any design aesthetic.